A signature part of the Muhammad Ali Scholar Program is an international learning journey designed to provide students with a first-hand experience learning about global social justice issues. 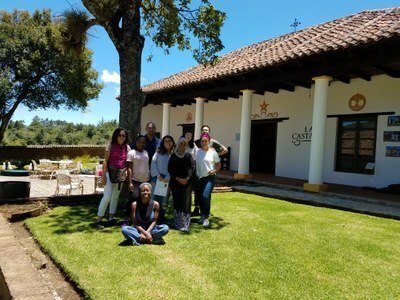 In August 2018, Muhammad Ali Scholars travelled to the place where the global Indigenous Peoples Movement began - San Cristobal de las Casas in Chiapas, Mexico. We studied the Zapatista Movement which emerged in the international stage in 1994 when the group took control of San Cristobal de las Casas to challenge the neoliberal policies of the North American Free Trade Agreement. The Zapatista Movement was well-known for one of its charismatic leaders, Subcommander Marcos. The Muhammad Ali Scholars also travelled to Oaxaca City and Mexico City. We read about the unique challenges facing Mexicans of African Descent identifying issues similar to those we face in the United States. The Muhammad Ali Scholars met with government officials and NGOs dedicated to advancing the rights of indigenous Mayan peoples and women, travelled to several towns to learn more about the unique cultures in southern Mexico, and visited archeological sites. The chaperones for the trip were Professor Enid Trucios-Haynes and Dr. Manuel Medina.